How To Fix Your Nicd Battery in less then 5 minutes - DIY NIAD Battery repair guide for all power tools. Same technique for all your NiCad batteries. Do not try the technique to any other type of battery. problem. Do you have a dead or weak cordless power tool battery? Looking for a cheap, effective way to repair them? You can fix following problems using our guide. * Battery has no power at all. * Give a new life to your dead NiCd batteries. * Get full power from your dead NiCd batteries. * Your NiCd batteries will take a charge and hold it longer. 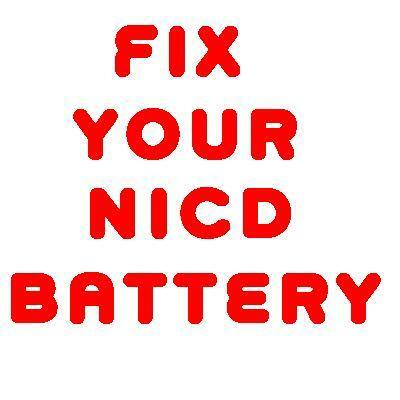 * Your NiCd batteries will run like new again. About 99 Success Rate! You Can fix these shorted crystal dendrites by "Revitalization through Vaporization of Dendrites (RVD) Process". We have a simple technique that transformed a totally dead battery into a like new performing battery that tested at 100 of it's charge capacity. used successfully by thousands of satisfied customers. *Learn the technique once and repeat it over and over on as many batteries as you like. and portable phones, cordless jig saws etc. *Give a new life to sealed batteries like the Firestorm and VersaPak in seconds. *Our step by step guide will enable you to resurrect rechargeable NiCd batteries to their full potential, so they will hold a charge. *Same technique for all your NiCd batteries. required. We will show you in details how to disassemble, resurrect and assemble them again. We will show you a step-by-step method that works and really works great! Your NiCd rechargeable battery will hold a full charge. Your battery will reach its full power & run time potential. here) and voltage source (DC Power Source; It could be your car battery, other tool batteries, welder or battery charger). Short list of supported brands.